Chris was born in Cardiff in 1962 and brought up in Cardiff, Spain and Cheltenham. He read English at Mansfield College Oxford (II.1) and Theology at Ripon College, Cuddesdon, before ordination in the Church of England in December 1986. He spent two and a half years as curate at All Saints, High Wycombe, before becoming Youth Chaplain to the diocese of Peterborough. In 1991 he left the Church to work for the Labour Party as Frank Dobson’s election agent and in 1993 he became the Labour Party’s Local Government Development Officer. The following year he became London Manager for the educational charity, Common Purpose. In 1996 he turned to full-time writing, publishing biographies of Stafford Cripps and Glenda Jackson and a history of Christian Socialism (Possible Dreams). From 1998-2000 he was Head of European Affairs at the BBC. Chris joined the Labour Party in 1986 and was Chair of the Christian Socialist Movement and a Hackney Councillor from 1993-8. He stood as Labour’s candidate in the 1997 General Election in Wycombe, a formerly ‘safe’ Tory seat which the Conservatives held this time with a mere 2,370 majority. 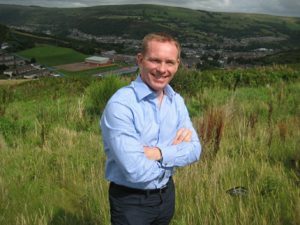 Following his election as Rhondda’s MP in June 2001 he has served on the Culture, Media and Sport Select Committee of the House of Commons, as well as the Joint Committee of the Lords and Commons on Reform of the House of Lords. From November 2002 to May 2007 he was Chair of the Labour Movement for Europe. Chris was re-elected as an MP (with an increased majority) in 2005 and from May 2005 to June 2006 was the Parliamentary Private Secretary to the Lord Chancellor, Lord Falconer of Thoroton (Secretary of State for Constitutional Affairs). Chris was the Parliamentary Private Secretary to Rt Hon Harriet Harman MP Leader of the House of Commons and Lord Privy Seal; Secretary of State for Equality and Minister for Women and Deputy Leader of the Labour Party from 2007 to 2008 when he was then appointed to the Government in the post of Deputy Leader of the House of Commons. In 2009 Chris was made Parliamentary Under-Secretary of State, Minister for Europe in the Foreign & Commonwealth Office. In 2010 following Labour’s defeat at the General Election Chris was made Shadow Justice Minister, with responsibility for political and constitutional reform. He was then appointed Shadow Home Office Minister with responsibility for immigration followed by a period as Shadow DWP Minister. He was later promoted to the Shadow Cabinet as Shadow Minister for Culture, Media & Sport and subsequently became Shadow Leader of the House of Commons. He resigned from the Shadow Cabinet in June 2016. He is an Associate of the National Youth Theatre of Great Britain and a member of the Co-op Party, Amnesty International, Amicus and the Fabians. He speaks fluent Spanish and good French. He lives in Porth in the Rhondda Fach.